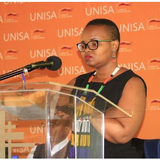 Lecturer in the Discipline of Christian Spirituality, in the department of Christian Spirituality, Church History and Missiology at the University of South Africa. Ordained minister in the Uniting Presbyterian Church in Southern Africa. Previoulsy an intern for Theology in the World Communion of Reformed Churches (WCRC) in Germany. In my doctoral thesis, I explored possible contours of dialogue between Black Theology of Liberation (BTL) and Womanist Theology for the liberation of a fragmented black humanity. I posit that like race and class, patriarchal violence is equally a fragmenting evil for a comprehensive liberation of black humanity, especially its tendency to elude Black male theologians. These are the themes I have reflected on in my own publications and I further interest in spiritualties of the Global South and dewesternizing discourses. Fundiswa Kobo changed their profile image. Fundiswa Kobo updated their profile information.